This is your big opportunity! The C-Suite is giving you 10 minutes to make a business case for your new service line to improve the health and delivery of care for older adults at your institution. Wow, I've watched Shark Tank on TV and I'm already sweating...(and I wake up from my dream). 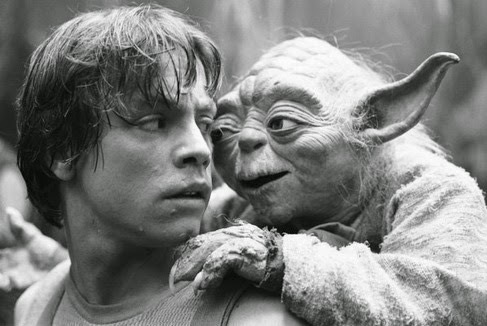 But more seriously, one morning before a project presentation, my 6-year old son, now a big fan of Star Wars, shouted out to me with his best Yoda voice, "Use the force, Dad!". As I begin the transition to mid-career in medicine, I got inspired to seek further Jedi training to grow and cultivate leadership skills. I have been fortunate to be part of the Practice Change Leaders (PCL) for Aging and Health program for 2014. The Practice Change Leaders is a national program to develop, support, and expand organizational leaders who are committed to achieving transformative improvements in care for older adults. The program, founded by Dr. Eric Coleman, is jointly supported by the John A. Hartford Foundation and Atlantic Philanthropies. This is a 1-year journey where participants complete a project at their institution aimed at improving care for older adults. The project becomes the vehicle for the hands-on learning of critical leadership skills. With the support of national Senior Leaders who provide mentoring, Practice Change Leaders engage in self-directed learning acquisition and content expertise to become more effective leaders. The best part of the experience so far is the shared pod learning with great feedback from Senior Leaders for your project and skill-building seminars from national leaders. How do you foster cultural change and a sense of urgency at your institution? How do you get more consumer engagement in your project? Last month in Chicago, at one of the 3 highly interactive national meetings, my peers and I had an amazing opportunity to give a business case presentation of our project to an expert panel (think of a wise, supportive Jedi Council). As geriatricians, we are aware of innovative approaches to enhance the health and function of older adults, yet often the greatest challenge is effective leadership to successfully implement evidence-based, best practices. But how do you become a change agent at your institution? I did not go to business school or take any formal leadership courses. I identified with Julie Thai's recent geripal post on the Geriatrician Syndrome, defined "a pathologically modest view of self in the context of one's role as a physician caring for older adults; cardinal features include: inability to accept praise and downplaying the significance of one's role in medicine". Most geriatricians I know are not comfortable about promoting their work and talking about themselves. As I reflect and look ahead, my passion and clinical interest is improving advance care planning and the quality of conversations in the outpatient setting to ensure patient wishes are explored, expressed, and honored. I am still a Jedi in training, but I highly recommend the PCL program for any geriatric healthcare professional interested in furthering their career satisfaction and dreams, learning how to implement clinical programs, and being an active participant of the national movement toward improving care for older adults. To learn more about the Practice Change Leaders for Aging and Health program, please visit www.changeleaders.org. From the website you may request an application (due August 27, 2014) and attend one of several informational calls to ask specific questions (you are welcome to join the calls anonymously). Please check your "geriatrician syndrome" at the door to come in and join us! Fresh and encouraging thinking. Our elder patients actually mentor us as we care for them, IF we are willing to listen and learn. And the seasoned practitioner shares with the learning one. It should be a natural flow.